Elipta Domo spreadlights provide a wide soft pool of light for the illumination of paths or steps and around the terrace, drive and lawn. 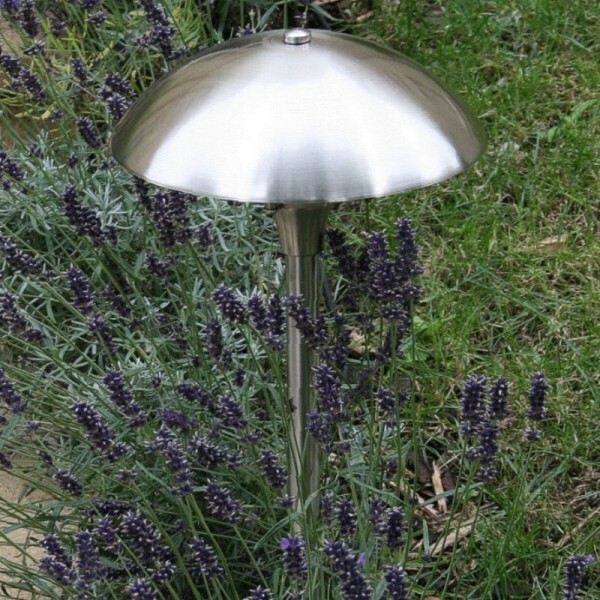 Brushed chrome finish is an alternative to copper spreadlights for more modern garden settings. These 12v spreadlights hide the light source under the shade for low glare lighting, providing a pool of light about 4m in diameter. A frosted glass dome protects the lamp from irrigation spray, diffuses the light from the halogen lamp and reduces lamp glare to improve visual comfort in sloping sites. The shade and dome assembly is easily removed and replaced with a screw action, so tools are not required for changing the lamp. Brushed chrome finish is an alternative to copper spreadlights for more modern garden settings: the brushed finish is subtle satin rather than shiny so it doesn''t appear garish in the garden.